I have always wanted to go to La Serre. Every time we drove along Emaar Boulevard I’ll look over at the double storey floor to ceiling glass facade and it’s always full. From friends, and the bits and pieces of social media that I’ve seen – they do good food. How did the long-awaited visit go? I think I had too high hopes for this place. And I probably chose the wrong time to go as well – remember the two weeks in February when there was no sun and it felt like winter…?? It just made the boulangerie area looked really dull, gloomy… not that it was their fault really, I don’t think most eateries in Dubai were made to suit a rainy day. When we got there, the indoors of the boulangerie was almost full, and we were told that we could sit upstairs, and was led to the lifts. Another staff met the one with us and explained that the bistro is shut till 12pm, and after back and forth between the two of, “But he told me to bring them up there,” and “It’s shut”, whilst the three of us waited awkwardly next to them, we were sent back to the dark boulangerie for breakfast by a very apologetic staff. It wasn’t his fault really, just an annoying instance of miscommunication. Strike two, not the best start to my mum’s birthday breakfast. We sat down at the corner, and went through the menu. 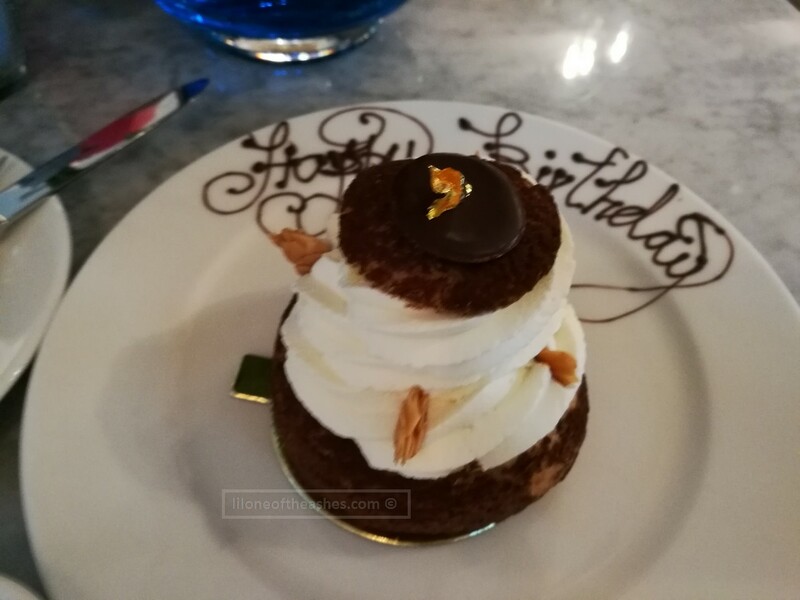 We decided on organic scrambled eggs with truffle for mum at 125 aed, and a “La Campagnarde” for myself – one of the Chef’s special crepes at 50 aed. Hats off to the kitchen team – mum’s scrambled eggs with truffle was a-ma-zing. If anyone can do perfect scrambled eggs, I’ll say they were the chefs at La Serre. Soft and creamy, they literally melted in your mouth. I know, we’re just talking about eggs here. Whilst I wouldn’t normally pay 125 aed for eggs, the price you pay is more so for the truffles. Oh, and toasted bread. Which they had forgotten to serve, until we went up to ask for it. It doesn’t stop there. They served mum’s eggs to the table, and then told me that they couldn’t do the La Campagnarde today because they didn’t have one of the ingredients. The staff then offered to do a modified version which I was quite happy to go with. It was a little odd though that they didn’t ask me at the get go, and decided to serve mum first. To be fair (and a little nicer), I kinda forgot about it all when my crepes came. Oh, if only I can remember what it was called.. tell them you want ” A modified version of La Campagnarde that Lil One Of The Ashes had ” It was absolutely divine – the melted cheese, the perfect crepes, the whole dish was perfect. I can now understand why people love breakfast at La Serre. So, was it an experience that lived up to my expectations? For a fine dining french bistro like that of La Serre, I expected no glitches in service. Maybe it was just one of those days.. you could say. The weather. The rain. Something. I don’t know. The food was definitely 10/10 though. The guy that served us, he was very sweet and polite to us and our little girl, and extremely apologetic for the things that was missed as well so I don’t blame him, in fact we actually we really liked him. I guess I expected more as an overall from the team! Have you been to La Serre? How was your experience? Deal : U by Emaar Birthday Deal (they offer different deals all the time… go ahead and check their website out). Cheers for this! Sorry it didn’t live up to expectations, but as you mention AED125 for eggs is a bit insane (especially if they forget the bread). Hope your next spot is a good one!